Well, I did warn you this would be the title of my next post. It’s prompted by an email I received recently from a writing friend, with the subject line “Business”. And by the last couple of months, which seem to have been incredibly busy somehow with a bunch of things which, while writing-related, are not actually writing itself. A couple of weeks ago, frustrated with my slow progress through the various WIPs, I decided to take a good hard look at where my days are going. Of course there is a slew of other bits and pieces crammed into my day – house, family, exercise and so on – but here is the graph that represents how the time I had available for work was divided over a two-week period. Ah, so that’s why I wasn’t getting much writing done! People warned me about this before my first novel was published, in much the same way they admonish expectant mothers to “make the most of this time, before the baby comes. It will never be like this again”. And in much the same vein, you never believe them. Because you’ve been waiting what feels like forever for this and you just want your baby to hurry up and be born already. So you think what do they know? It’ll be fine! I’m going to love it! And you do love it, of course. This is not intended to be a litany of complaint. I know how very very fortunate I am to be in this position. I once dreamed of going to launches and writing blurbs and doing promotion and school visits. I love all of it. And I know that in my struggling-to-get- my-foot-in-the-door days, if I’d I heard a writer complaining about the terrible toll having these many books published was taking on their writing, I would have had to resist the urge to smack them firmly upside the head. In a writing sense, these fall very squarely under the category of what we at our house like to refer to as “first-world problems”. But they’re real, nonetheless. And I guess what I’m saying is that I need to be aware of all this and of the very real chunk it does take out of my writing time. And move to mitigate that if necessary. Which it may well be. Because the writing is the point, first and foremost, and when it gets squeezed into the cracks of the “business” side of things, there’s something rather topsy turvy about that. Of course, I’m thinking about all this and how I really need a night at home to try and get some words in on the WIP, when all of a sudden two delightful gentlemen announce that they’ve scored a new book contract and are getting together that same evening to celebrate and would I perchance like to come along? And of course I would, because this is the absolute best stuff of all and what it’s all about, in the end, and sitting at the Windsor on a balmy Perth evening eating pizza and drinking champagne and grinning broadly from ear to ear has absolutely nothing at all to do with business when you really think about it. In closing, I leave you with my favourite pie graph of all time, altogether more satisfying than my own. * I’m not sure where this image originated, but I’ve taken this version from Boing Boing. This entry was posted in Uncategorized and tagged busybusybusy, not-writing, writing on March 13, 2010 by Meg McKinlay. I'm exhausted just reading your blog. I knew there was a reason why I was holding myself back from being published. No, jokes aside! You're doing a fine job, Meg! Reading this exhausted me too, but in a good way (and my brain is sadly the easily exhausted type). You do all that? When do you have time to mess around on the internet, stumbling from random site to site? The new baby comparison is apt. Everyone warned me; I listened with half an ear. Now I see new mothers and have to bite my tongue. OMG!! 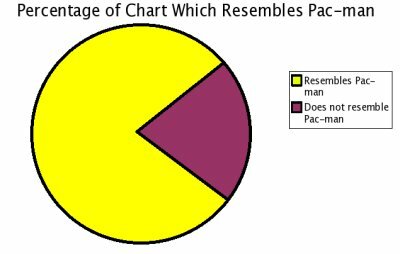 I LOVE the Pacman graph! I only hope I can someday be as busy with non-writing related writing work. 🙂 I'm already spending way too much time with this whole blogging thing. I'd love to have to share some of it with promoting a book! Enjoy! Anonymous – thanks! Feel free to join me in my craziness any time. Mary – I think I'm easily exhausted, too. And might do better if I spent less time trying to take stock of all the things I have to do and more time actually getting them done. Internet stumbling is a late-night enterprise. Thankfully, I don't sleep much. Lisa – glad you liked Pacman. It's kind of perfect, isn't it? And I do know what you mean, and am very grateful for the non-writing-writing-related-work. And really hesitated to post any of this for that reason. And am enjoying all of it (while also freaking out). I forgot to put blogging on my list, didn't I? I do try to keep it to about fifteen minutes once a week; reading other people's blogs falls, of course, into the category of late-night stumbling, so doesn't count as actual time.